Notes from the Toybox: Misled about the Terrible Twos. Just before Princess C was born, I remember there being a trend for parents to come up and first congratulate us, then commiserate with us that aside from the poo, the sick, the sleepless nights, the empty wallet, the destruction of personal property and all those little things that tiny babies bring to new parents - we would have it easy up until C hit two years old. As she approaches 5, and after a weekend of "Big Shouting Days" we're wondering when the terrible twos actually finishes. Is it around the age of 22 perhaps? The worst thing about the situation when a mumbled grump turns into a full on nuclear meltdown is that you, as a parent, have absolutely NOTHING in your arsenal that is effective against a child's tantrum. Not. One. Thing. Well meaning parenting blogs will assure you that A) it's so easy to avoid the situation arising and B) that reasoning with a child, calming down, removing them from the situation and distraction are superbly effective against a child in full-on screech mode. So you end up feeling a bit crap when none of those work and you're forced to fall back on other means of heading off a meltdown of biblical proportions. 1) Bribery. Forget it. You're a loving parent who wants only the best for their child. Bribing them with more goodies is like loading snowballs into a blast furnace to tone the heat down and feels like you're actually trying to head off the behaviour with a reward of sorts. 2) Threats. Again, forget it. You have nothing - NOTHING that will work against a child's razor sharp insight into modern parenting. They know you can't resort to the methods your parents did (like giving them the legendary 'thick ear' - I'm still not sure what one is but I am sure I wouldn't like one) and we live in a better world because of it. Likewise threatening the removal of nice things (christmas presents, santa coming down the chimney as recent examples - or birthday presents, visiting friends and other things a child looks forward to) just doesn't work even if you have an iron resolve and can follow those threats up. 3) The naughty step. Oh ho ho ho, I love the naughty step. I'm not sure how your house is set up but I've never seen a bottom step of a staircase that has a containing forcefield that can keep a child sat in place for the pre-agreed amount of time you want them to stay on the naughty step for. You never see those outtakes of Supernanny where Jo Frost has to put a screaming child in full tantrum mode back on the naughty step 3000 times until the camera ran out of film. 4) "Go to your room!" Forget it. Again, I've never seen a house that's so sturdily built that it can withstand the onslaught of a child's tantrum (assuming, of course, sneaky parents haven't installed a padded cell in their abodes). We like our neighbours too much to submit them to having to listen to C kicking the door, stamping on the floor, bashing the wall or generally ensuring she makes the same amount of noise as a Barbarian Horde. 5) The 'Scream chart' - We recently started one of these again and sometimes charts DO work but you really do have to agree what the outcome of a chart is going to be and stick to it like glue! 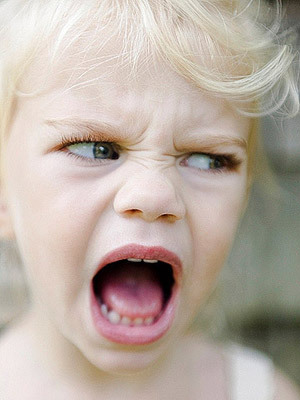 The horrible thing about tantrums is that they erupt over the most stupidly insignificant things. This weekend we had tantrums about doing homework, food, going for a wee before we go out, actually going out in the first place, putting sauce on food, eating an entire meal, sleeping or being tired. In the end, there's really nothing that can be done and in the end we resorted to getting out of the house (if for no other reason than to spare our poor neighbours' sanity - though with three daughters I'm sure they've been through this themselves in the past) and going for a walk out in the fresh air. It's not always possible but it did work in this instance and stopped us from going quietly insane at least.